Young Dons scrum-half Richard Wilkinson looks set to build on an impressive debut season at the Championship club on the evidence of the warm-up campaign. “Richard is dangerous with the ball in hand and he challenges the (defensive) line,” said player-coach Paul Cooke. “He’s defensively strong and he’s certainly developing into a quality player. 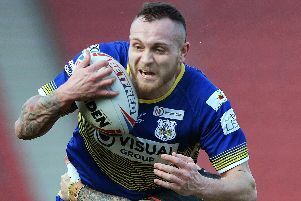 With more and more Super League clubs looking at promising talent in the Championship, some supporters are already expressing concerns as to whether the Dons - who hope to be challenging for a return to the top flight over the next couple of years - will be able to keep hold of Wilkinson. Cooke himself admits that the Hull-based half-back has the potential to play at a higher level one day. “I’ve sat down with Richard and told him that he can either be a very, very good Championship player or still force his way back up to elite level,” he said. “I’ve told him at length what he needs to do to achieve that. He added: “I’m not worried about losing him to anybody. Dons host Championship rivals Hunslet on Sunday (3pm) in their third pre-season friendly.